Marriages are always under attack because it is a “Holy Institution” according to Malachi. That is why statistics show that over 50% of marriages end up in divorce court. For a second marriage statistics show about 74% of marriages do not make it. This is exactly what the devil wants to do to your marriage. The enemy “fights dirty” against the survival of your marriage. CASE AND POINT: In 1983 there was a tragic and fatal boxing story. It was a Jr. Middleweight bout between Collins versus Resto. Billy Collins Jr. was from Tennessee and Luis Resto was from Puerto Rico. Collins had never lost a match and was the favorite to win. He was to be a contender for the championship. 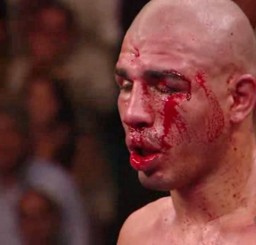 Collins face was beat so bad that after a few rounds, he was unrecognizable. He lost the fight to Resto. When they went to shake hands, it was noticed that Restos glove had a slit in it. The padding had been removed by someone and that left Collins face to be hit by direct knuckles in every punch. Collins was left with permanent eye damage in his left iris, which was teared. Permanently blurred vision. This rising stars boxing career was finished. Less than a year later he was DUI and his car crashed and landed in a river, killing him. Whether it was a suicide or a DUI, he was dead at age 22. Twenty five years later a documentary was made because the producer wanted to clear Resto’s name and shame for being responsible for the ripped glove. After days and hours of interviews, Resto could not live with the guilt any longer. He confessed that there was $23,000 involved in a fixed fight by his trainer. His padding had been removed from his glove before the fight and cement was placed around the outside gauze of his knuckles. Plus he was given an enhancer in his water. Between him and his trainer, it cost the life of an upcoming star. Your marriage has victory over the devil in Jesus name! God never uses the devils work to deal with us. God deals with us on a higher level. God was warning Cain that satan was crouched at his door just waiting to control his life. Cain chose to let jealousy in and ended up murdering his brother. Hedges were planted around houses to keep out dangerous snakes. Don’t leave spiritual hedges open or you will be bitten!! Wow, awesome article! The devil is a liar, and He stikes us when we are most vulnerable: just had a baby, that time of month, begining of marriages, etc. Thats why it is important to be prayed up in our armor of God, being “watchful” as the word says for any oppertunity the enemy might try to use. Amen, I really enjoy these!